I thought for this week’s book review, I’d share a really helpful book for those building their credit score. There are some great books on how to accomplish that, but this one is a bit different. 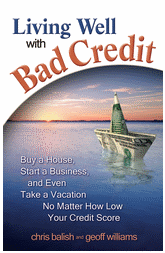 Living Well with Bad Credit shows you what to do in the meantime. The most practical chapter in the book, Balish and Williams show how “unbanked” Americans can get their banking needs met. Having options can be a great alternative to pay day loans. Balish and Williams go over the Chexsystems database and how it affects you. They also cover entering into a second chance program to open an account with certain banks. They also offer tips on building a solid history withyour bank or credit union. There is no real way for you to dig yourself out of debt if you don’t have some income stream. Balish and Williams goes over the delicate job interviews where your finances are discussed. They also explain how your credit report can be a factor in being hired and which careers rely more heavily on them. There is a lot of practical advice in the chapter and something for everyone to at least review before applying for their next job. Do you think that this is something you’d be interested in? Did you know there was a book that covered this topic? When you finish reading the book, I’d love to hear your thoughts.